This is probably the easiest ray to identify. Broad angular disc, twice as wide as long, strongly concave posterior with angular tips. Dark brown to black with series of lighter spots/circles on the dorsal surface. Disc white ventrally. Large fleshy subrostral lobe. Dorsal fin near base of whip-like tail followed posterior by a venomous spine(s). Wingspan up to 10 feet (3 m) and up to 500 pounds (227 kg). Maximum total length (tip of snout to tip end of tail) is about 17 feet (5.2 m). Life expectancy ranges from 4 to 6 years. 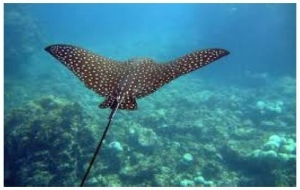 Commonly found in shallow inshore waters such as bays, and coral reefs, but also in depths of around 200 feet. Feeds mainly on bivalves but also eats shrimp, crabs, octopus, worms, whelks, and small fishes. Aplacental viviparity (fertilized stingray eggs remain in the mother’s uterus, ingesting their yolk sacs. Once they have fully consumed their yolk sacs, the embryo is nourished by “uterine milk”), a lipid- and protein-rich fluid, secreted by the mother. Gestation period is estimated to be about one year. Up to four pups per litter. Protected in Florida state waters. Often seen swimming near the water surface, occasionally leaping completely out of the water. Frequently forming large schools during the non-breeding season. Non-aggressive species of little danger to humans with the exception of their defensive venomous barb located near the base of the tail. Avoid handling or exercise extreme caution.